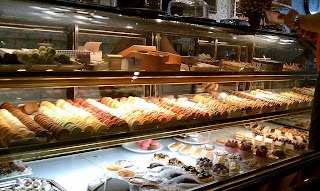 Marcus and I were in the Flat Iron District in search of a desk for his new apartment when I suddenly saw Madeleine Patisserie out of the corner of my eye. My eyes widened. All I said to him was that we needed to go in there, and then proceeded to take his hand, pulling him inside before he could ask any questions. I don't recall where I had heard about Madeleine Patisserie, but it was definitely on my eventually-go-to list in the back of my mind. I don't frequent that area much, but I probably should now that macarons are involved! As we went in, my eyes didn't look away from the rows and rows of multi-pastel-colored cookies. There were soo many flavors of macarons! Marcus appeared to be having the same reaction, considering he said to me something along the lines of: "Stefie, I want all of them. I want to line them up all in a row and eat them as if I were a tractor." We spent about 20 minutes contemplating which flavors to order. I think Marcus was a little disappointed to realize that we could only have so many in one day--unfortunately, the downside of having delicious macarons is that they can add up very quickly, $ wise! There were some framed press articles regarding the bakery, and I briefly read that one recommended the raspberry macaron, so that was already decided. Since I love anything pistachio flavored, and being one of my favorite cocktails is the kir royale (lovely mixture of champagne and crème de cassis--black currant-flavored liquer), I decided on the pistachio cookie and cassis filling macaron. Marcus chose pink champagne and mango (I'll have to ask him how he decided on those, haha). 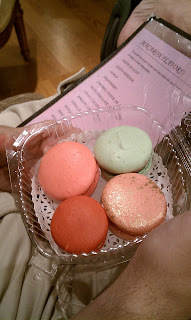 (clockwise from top left): raspberry, pistachio / cassis, pink champagne, and mango! The girl at the counter put together our macaron order told us that macarons are recommended to be eaten at room temperature. I thanked her, and we sat down on the bench inside the bakery. I obviously wanted to wait to eat them at the recommended temperature, but Marcus, being as impatient as he is, went right for them. He was right, though. They looked too delicious not to eat! I followed suit. Findings: Madeleine Patisserie's combination of texture and flavor is very well balanced, making for an amazing macaron. Not too batter-y and not too sweet. I'm more biased toward tart-flavored things, so this is definitely a winner for me. I'm sure if we let them sit out for a little bit, they would've been even more delicious! I can't really decide which one flavor was my favorite, but I will give them creativity for the pink champagne and the combination of pistachio-cassis. All in all, VERY HIGHLY RECOMMENDED. We're already talking about going back this weekend! Price point: 4 macarons for $10. P. S. I'd like to thank my best friend, Erin, for introducing me to macarons (I bought her a box of 9 macarons that very day)! Merci beaucoup, I am now an addict.